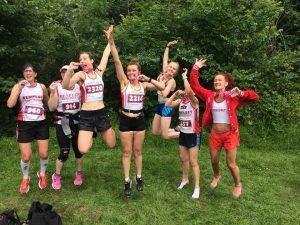 I think the first shout out of the weekend must go to the Marshalls at Southend Half, too many to mention and I would hate to miss anybody out so a big thank you to Bobby and all the team. In Islas words you made us all feel like Films stars with your cheers and name checks the full length of the promenade. To the race itself we had PB’s, 1st timers and team trophies – just another weekend in the life of BRC! Starting with the boys we won 1st male team, 1st home for BRC was Chris Wayman with a PB in 6th in a time of 1.15.36 followed closely by Lee Baynton in 7th 13 seconds later in 1.15.49, and then making up the winning team of 3 was Graham Booty in 1.21.30 in position 19. Next was Matthew Bird (34), George Watts (41) Peter Stalley (53) and Keiron McGill (87). Roy Harwood (129) wondering if Ciaran was running scared by not racing today managed a massive 3 minute 40 PB even without him at his heels. Next came Doug Stephens (169), Stephen Burton (179), Michael Waters (209), Andrew Watson (411) with a superb 2.5min PB, Trevor Mickleburgh (457) and pacing a friend for 1.45 Daniel Carter (467). In his longest race for a year next came Daniel Lyons (533) followed 4 seconds later by Graeme Newman (535). Steve Wise (706) was next pacing his cousin who had targeted 2hours but he pushed her to 1.52, followed Ian Caldwell (1017) who might have to steal PB’s nick name with a massive 11 minute plus PB with his 1st Sub 2 hour half, last but not least for BRC was Lee Allen (1486) out of over 2000 runners. The women’s team did not quite keep up with the boys but still came an impressive 3rd with Isla Sinclair leading the way with a fantastic 28th women home and only missing her PB by 3 seconds! In 1.43.10 followed 15 seconds later despite suffering badly with cramp by Danielle Giannotti (30) in 1.43.25 and a massive PB of over 13 minutes and then Nikki Leigh (77) in 1.49.13. 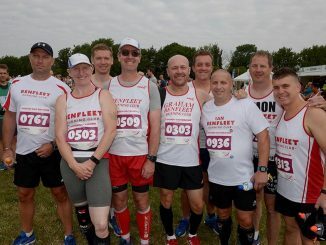 In what was probably a more scenic route and now doubt more hilly than the Southend half Sam & Brian Venton ran in the 2 Castles 10k – from Warwick Castle to Kenilworth Castle. Brian can 216th out of nearly 4000 runners in 42.31 and Sam came 1684th in a sub 1hour in 59.55. 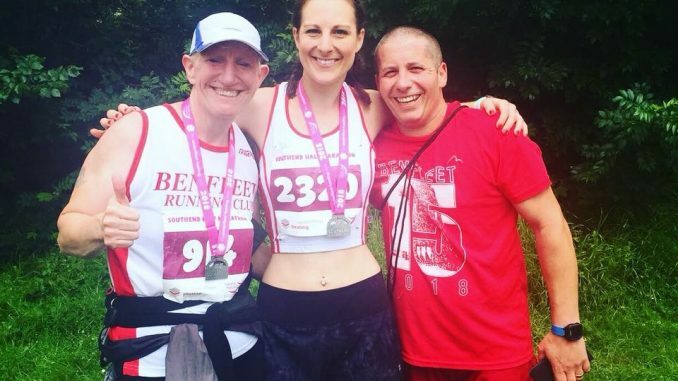 Earlier in the week PB Steve Burton lived up to his name with a 4.27 PB over 5 miles in the Birkenhead Park 5 Mile in 34.48 and position 118 out of 350 runners. Last but not least Mark Cowan competed in his 1st Mid Distance triathlon. 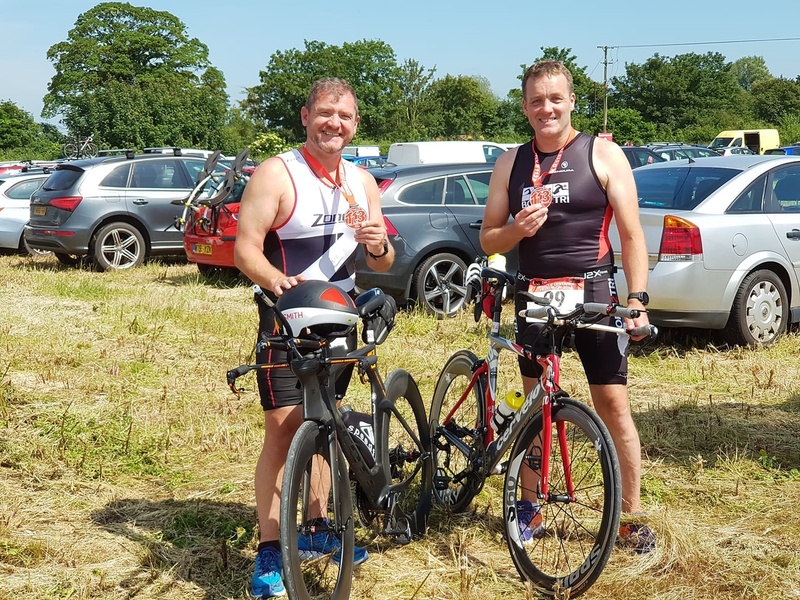 Set in the Heart of the Picturesque Cotswolds Mark completed a 1.2 mile swim in 46.25, a 56 mile bike ride in 2.59 and a nice little half marathon run to finish in 2.27. Despite a number of challenges including cramp Mark finished in 6.21 and position 644 out of 826 competitors.